A long weekend, with four great days of walking, stretches before me. It is midday on Friday when I arrive at Littlehampton’s East Beach and my plan is to walk into Bognor Regis for a late lunch. The tide is coming in and much of the sand is covered. 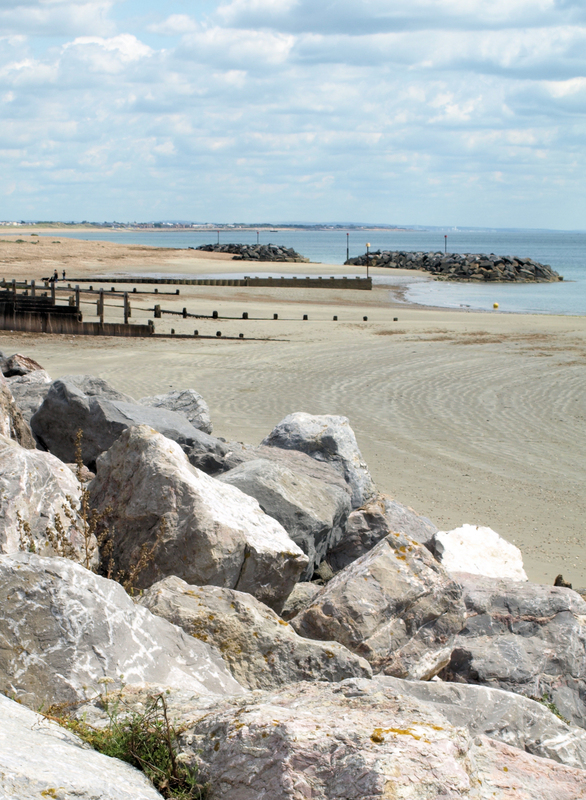 I walk along the top of the beach, over packed-down shingle, around the top of groynes. As I start this walk, to my right are fields and open countryside. As I approach Middleton-on-Sea and, later, Bognor Regis, more and more houses appear. In the distance, I can make out a finger of low-lying land, extending out into the sea. That must be Selsey Bill. Beyond this low land, I can see a higher cliff. Is that towards Portsmouth, I wonder? I didn’t think there were cliffs ahead. Strange. Perhaps my eyes are playing tricks on me. I come to an area of beach where artificial breakwaters – large rocks – have been formed to protect the shore from erosion. Between the gaps in the breakwaters, small semi-circular ‘coves’ have been formed. I am reminded of the first time I saw similar breakwater reefs, back in Sea Palling, Norfolk. I perch on one of the breakwaters and have a drink and a snack. The tide is still coming in and I am surprised to see how quickly the water begins to swirl around the base of the breakwater. I realise I am in danger of being stranded and quickly climb down off the rocks and head back up to the top of the beach. I see an egret, flying low and graceful above me. I pull out my camera, but am not quick enough. By the time I am ready, the egret has landed some distance away. I take this fuzzy shot of the bird on the beach. Then it is off again and I manage to capture it in flight. I really love these birds. 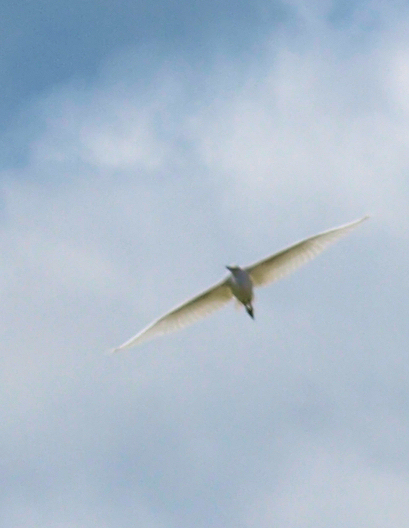 They are unmistakable – completely white plumage and very stylish in flight. 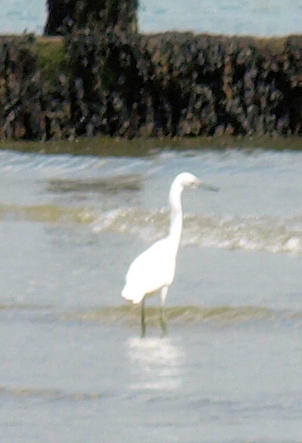 This might be a little egret, a common bird on the coast around here. But, I think, with the large wing span and paler legs and beak, this is probably great white egret. I am walking through an area called Middleton-on-Sea. The sky has become cloudier and the sun goes in and out. Ahead, along the coast, lit up by a patch of sunlight, I see some white, tent-like structures. I know I am approaching Bognor Regis and I wonder what the white structures are. When I draw nearer, walking along a wide promenade, I realise the ‘tents’ are permanent structures, the roof of a holiday park with a large swimming pool, a hotel and residential buildings. The beach here is still shingle. Maybe there is sand when the tide goes out? I don’t know. 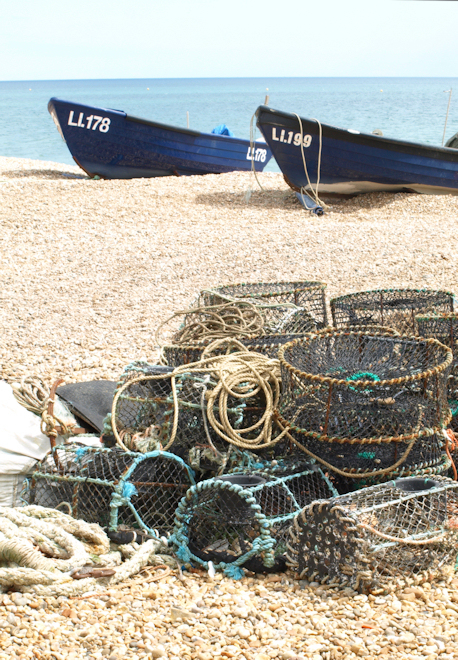 As well as the trappings of a holiday resort, Bognor beach has fishing boats, fishing nets and crab (or lobster) pots. The place is not crowded with the summer holidays yet to begin. I have enjoyed the walk so far, but am getting tired and hungry. So, I look forward to finding the pier, where I am planning to meet up with husband for lunch. The pier turns out to be a big disappointment. Yet another pier destroyed by storms and fire, then left to disintegrate. What a shame. Originally opened in 1865, the pier once had a pavilion and a landing stage for pleasure craft. You can read about its history on the Heritage Trail Website. You can see how the pier once looked from old postcards. What remains of the pier (a building on the landward end) is being used as a nightclub. But there is some sort of construction going on at the end of the pier. I wonder what they are doing with it. The ruined pier was once the site of the Birdman competition – the competition for human-powered flying machines. 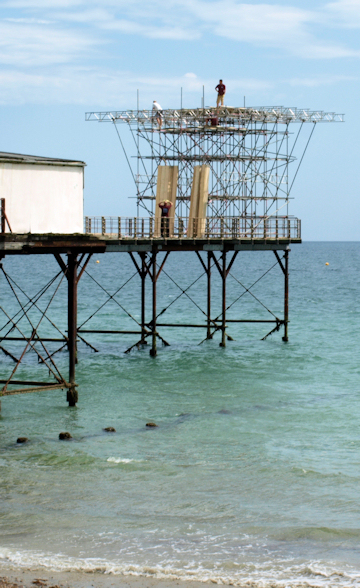 But the event has moved to Worthing because the pier at Bognor became too dangerous to use. We have lunch in a cafe where the food was good and the signs proudly claim – ‘open all day’. We arrive at 3:00 and are just finishing our lunch at 3:30 when we are somewhat surprised to see people being turned away. ‘Open all day’, we are amused to find out, means open between 10:00 am and 4:00pm. Last orders are taken 30 mins before closing time. We were lucky to get our lunch. 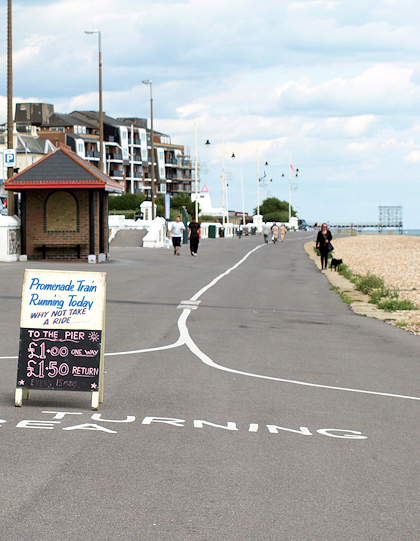 After lunch, I walk westward, along the Bognor promenade. 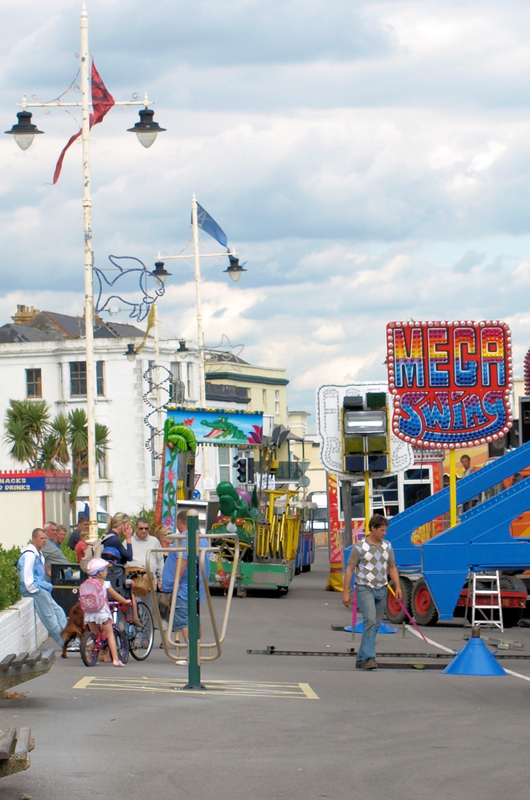 A fun fair is arriving. Large trucks are lining up to unload alongside the promenade. Men unpack the trucks, quickly and efficiently constructing the various amusements. I see a dodgems being assembled. A small crowd gathers to watch. Further along, I come to a part of the promenade with a wide circle painted in white paint. A young couple with a very excited toddler are standing here. They are waiting for the ‘promenade train’. This is its end point and turning circle. At the end of the promenade, private housing restricts access to the beach. I would like to walk on the sand, but the tide is high and there are only dangerous rocks and ‘Keep Off’ signs. Reluctantly, I turn inland and walk through an area of housing. There are new estates here – all with ‘Private’ signs, although I guess the roads are actually public roads with free public access. Amongst the housing, with no sight of the sea, I get rather lost. Eventually, more by luck than good map-reading, I find a footpath back to the shore. 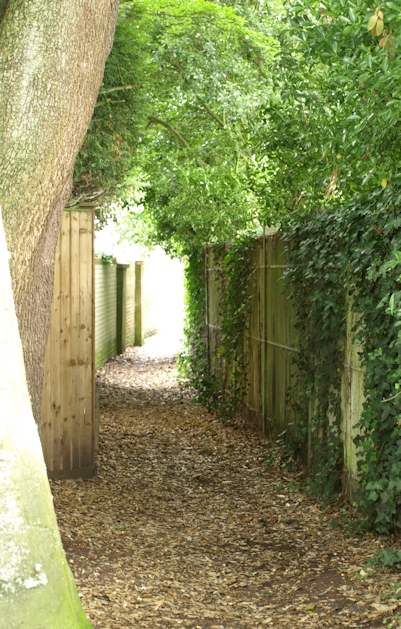 The footpath signs are well hidden, almost buried in a hedge and not visible until you get to the end of a ‘private’ road. I hope the path leads to the beach, although it is not indicated on the sign. I walk down a tunnel of greenery, between tall garden fences and, to my great relief, find myself back on the shingle shore. The going is difficult. The shingle is loose and there is no clear path. If it wasn’t so tiring, I would really enjoy this section of the walk. The beach is almost empty. Plants are growing on the shingle and the view is attractive. The light is fading. Although there are many hours before sunset, dark clouds are piling up overhead. Conditions are poor for photography. I am anxious about rain and hurry, as best I can, over the rough shingle. 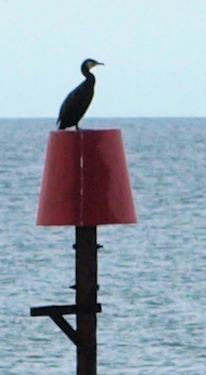 On one of the breakwater posts, I see a cormorant – black and sinister in the darkening light. 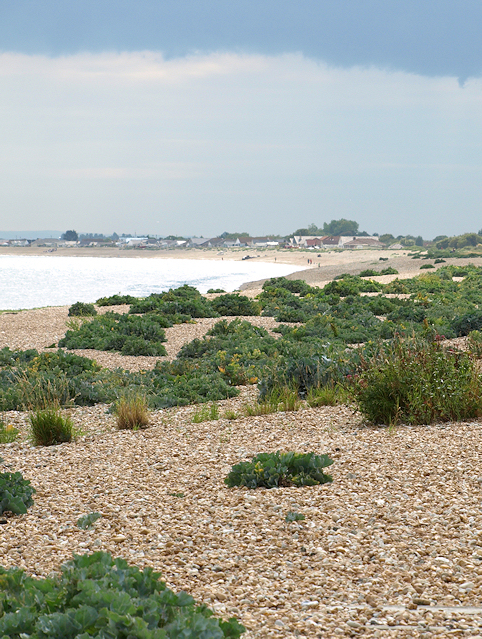 The way ahead along the coast is interrupted by the entrance to Pagham Harbour. Here there is a car park and people are walking on the shingle. Spots of rain are beginning to fall. People begin running back to their cars. I stop to get out my waterproofs, wrap my camera in plastic and bury my iPhone in an internal pocket. Then I continue, walking through the car park, to the nature reserve that borders Pagham Harbour. Once upon a time, this was a proper harbour, with deep water and shipping. As the harbour mouth silted up, the land was reclaimed as agricultural land. 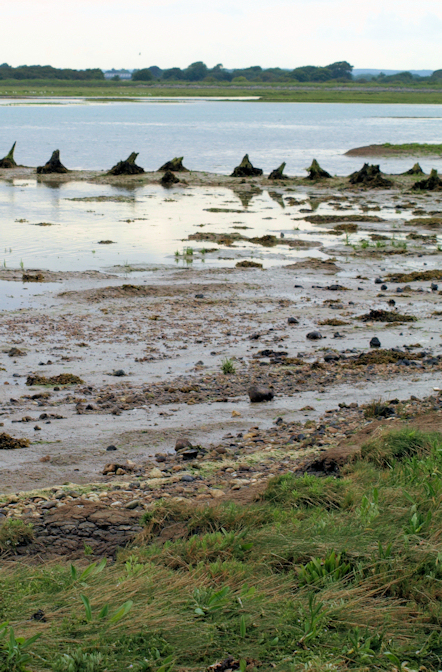 The sea broke through some years ago, flooding the area again and forming an extensive marshy area. It has been left as a nature reserve – a huge area of tidal mud flats, marsh land, water, vegetation and wildlife. I walk along a footpath. To my left is the wide area of Pagham Harbour. To my right is a smaller, deeper lake, with ducks, swans and gulls. Past the lake, there is a caravan park and housing – but all set back in the distance. As a result of the bad weather, everybody else has vanished. I am totally alone for this part of the walk, as I follow the path along the muddy shoreline. Old, decaying wooden structures stick out of the mud, looking like giant, rotting teeth. The rain stops but the light is fading fast. I hurry as best I can. Instead of shingle, there is mud to contend with now. I slip and slide. Ahead I see a couple of bird watchers, sitting under umbrellas, by a ‘hide’. At this point, I am forced to walk along the muddy skirt of a protective wall. 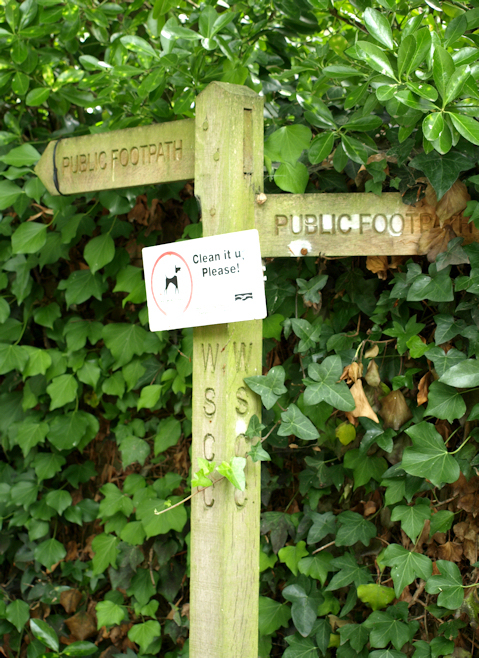 I wonder if I have lost the footpath entirely. The bird watchers watch me with blank expressions under their caps. They might be irritated by my stumbling intrusion. I wonder if I have scared any birds away. At the end of the wall is a track. I turn inland, following the track, heading into the village of Pagham. Here I end my walk for the day. This entry was posted in 06 Sussex and tagged birds, coast, hiking, photography, travel, walking. Bookmark the permalink. That highland is the Isle of Wight. On the Picture Of the rocks, I can see Brighton sticking out.